It is very important to have Indian wedding cards, indian wedding invitations, Wedding Card designs, hindu wedding cards, designer wedding cards, muslim wedding cards, christian wedding cards, jeweled wedding cards, indian invitations which are of very high quality. This is because the right Wedding Card designs will set the tone of the wedding. Your wedding card, wedding invitation, scroll invitations, scroll cards, is the first impression you make on the guests who will share your special day with you. The perfect beginning to your dream wedding is the perfect Indian wedding cards. If only it were so simple. However, you may not really know what you have to do in order to get such a wedding cards. A good wedding card should reflect the theme of your wedding. Besides, it should also reflect the personalities of you and your spouse. It should be able to tell your guests the information related to your wedding event. You can make your wedding card unique by personalizing it. There are some tips and steps you may consider so that you can make your wedding invitation more unique. We offer designer wedding cards, designer wedding invitations, designer marriage cards, desigern invitations, exclusive designer high end cards, printed designer wedding cards and designer indian wedding cards which not only compliments your lifestyle, but are in perfect sync with your vision of a complete designer wedding invitation card. There is something or the other for everyone. Our scroll invitations range offers aesthetically crafted royal scroll wedding invitations, scroll invitations, indian scroll wedding invitations, scroll wedding cards, designer scroll wedding invitations made of handmade paper and vellum paper, velvet. These scroll invitations comes in box packaging. We also offer coordinated wedding stationery. The jeweled wedding cards, jeweled wedding invitations, or jewels studded wedding cards categorized here display exquisite craftsmanship using real gemstones, making them a class apart for the 'jewels' in your life. The key factor here is innovation and constant search for the unusual. Muslim wedding cards or muslim wedding invitation cards, also known as islamic wedding cards, islamic nikaah cards or walima cards offered within this category comprises of handmade paper wedding cards, wedding cards with jewels and regular paper wedding invitation cards, having unique pattern, texture & grains. Exclusive indian wedding invitations, designer indian wedding invitations, indian wedding invitation cards, indian wedding cards, wedding card designs, scroll wedding invitations from Universal! 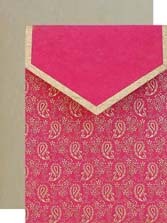 We present a splendid array of selected wedding invitation cards for the connoisseurs like you. These wedding cards have to be seen to be believed. In fact, our indian wedding invitations range covers almost every classification one can think of. Take a pick of wedding cards from our unmatched collection of sikh wedding cards, punjabi sikh wedding cards and sikh wedding invitation cards, punjabi wedding cards, sikh invitations, sikh wedding card designs which is simply awesome. These cards are perfect to grace those special cherished moments in your life and are in perfect sync with your vision perfect wedding invitations. Unique wedding cards, exclusive invitations, Universal wedding cards, indian wedding cards in this category presents a splendid array of indian wedding invitation cards. Range of our unique indian wedding cards includes Hindu wedding cards, Muslim wedding cards, Sikh wedding cards, Christian wedding cards, etc. Hindu wedding cards, hindu wedding invitations, wedding card designs, designer hindu wedding cards and hindu wedding invitation cards, hindu wedding card designs are unique and exquisitely alluring, ranging from simple & elegant to flamboyant style. These wedding invitation cards are unique and intricate work and carries unconventional blend of traditions and modern art. We offer handmade wedding cards, designer handmade wedding cards, handmade wedding cards sample, handmade wedding invitation cards and handmade wedding ceremony cards which not only compliments your lifestyle, but are in perfect sync with your vision of a complete handcrafted wedding invitation card. It is very important for you to make the invitations reflect the personality of you and your spouse. You may work with a card designer in order to create a perfect wedding invitation. However, you will need to make sure that you can spend the time to be involved in the design process. Indian wedding cards, indian wedding invitations, indian wedding cards usa, indian wedding invitations usa, designer wedding cards, hindu wedding cards, designer wedding invitations, hindu wedding invitations, scroll invitations, scroll wedding cards, wedding cards designs, universal wedding cards jaiupr india. Make sure that the wordings in the cards are easy to understand. You do not need to follow any template when you are creating the wordings for your cards. However, it is very important that you include all the information about your wedding in the card. You can start making your wedding cards unique by first selecting the wedding cards from the following sections and then you can contact us for any ideas of making it personalized.